Business activity for US hoteliers rose to a reading of 122.0 in April according to today's release of the Hotel Industry's Pulse (HIP) indicator. Business activity for US hoteliers rose to a reading of 122.0 in April according to today's release of the Hotel Industry's Pulse (HIP) indicator. 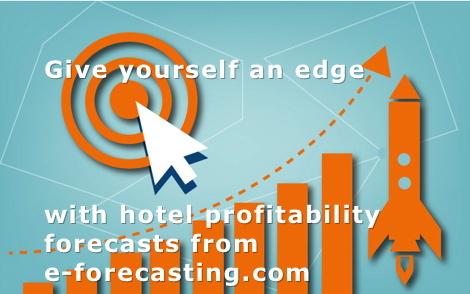 "Our predictive analytic, which gauges monthly overall business conditions for hotels earlier than any industry indicator, climbed by 0.1% in April after an increase of 0.1% in March, said Maria Sogard, CEO at e-forecasting.com. HIP's six-month growth rate, which has historically confirmed the turning points in US hotel business activity, posted a positive rate of 1.6% in April, following a positive rate of 1.8% in March. This compares to a long-term annual growth rate of 2%, the same as the 40-year average annual growth rate of the industry's gross domestic product. Two of the three demand and supply indicators of current business activity that make up Hotel Industry's Pulse (HIP) Index had a positive contribution to its change in April: Hotel Jobs; Hotel Capacity; The current business activity indicator which had a negative or zero contribution to HIP's change in April was Total Hotel Revenues (includes non-room revenues). "The probability of the hotel industry being in recession, which is detected in real-time from HIP with the help of sophisticated statistical techniques, registered 23.5 % in April, up from 21.8% reported in March," said Evangelos Otto Simos, Professor at the University of New Hampshire and Predictive Analytics Database Editor for e-forecasting.com. "When this recession-warning gauge passes the threshold probability of 50%, the US hotel industry has entered a recession," Evangelos added. e-forecasting.com, an international research and predictive intelligence consulting firm, offers disruptive predictive analytics of the economic and business environment using proprietary, real-time information content to produce customized solutions for what’s next.